The Moyle organ now in St Linus' Anglican Church was built, probably in the 1850s, by James Moyle of Prahran, who was among the first organbuilders in Melbourne. Little is known of the history of the organ. It is likely to have been built for a private home, and it could have been at one stage in St John's Anglican Church, Horsham. By 1930 it was in St Cuthbert's Anglican Church, Brunswick, but was removed in about 1975 and stored at Christ Church, Brunswick. In 1978 it was given by the parish to the National Trust of Australia (Victoria). The restoration of the instrument began in 1984 following an appeal, launched in 1983 by the then Prime Minister, Bob Hawke, organised by the Organ Historical Trust of Australia. The restoration, of the windchest (including the fitting of a new table), bellows, action and pipework, was carried out by George Fincham & Sons of Richmond. The casework was restored by George Vlahiogannis, of Rendec Pty Ltd of Northcote. In 1985, following the restoration, the organ was placed in St Linus Anglican Church, Merlynston on permanent loan from the National Trust. This organ is a small instrument of chamber organ dimensions, with a distinctive Gothic style case. There are three flats of gilded wooden dummy pipes placed within three cusped arches on the front of the instrument. The cornice of the case is boldly crenellated and the music desk, carved in oak, incorporates a lyre motif. The casework is of pine which has been stained and finished to resemble cedar, although the latter material has been used for the keyboard assembly. The hood moulds above the three cusped arches were at some stage removed and have been replaced. The original builder's nameplate survives. The wooden pipework bears the impressed mark 'J. Moyle', but the metal pipework was almost certainly imported. The Moyle organ is of historical significance to the state of Victoria. 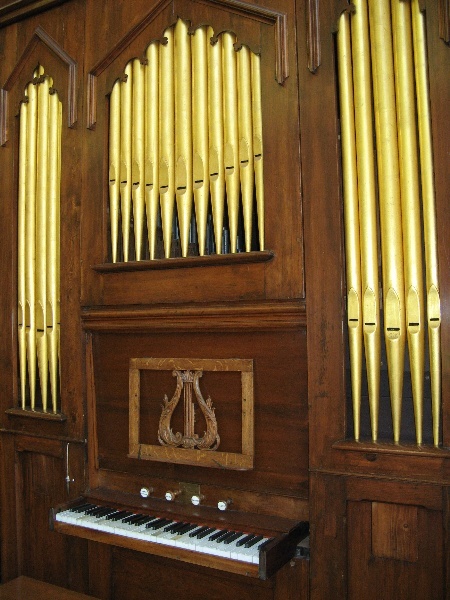 The Moyle organ in St Linus' Anglican Church is of historical significance as the earliest known example of local organbuilding in Victoria. It is the only known surviving example of the work of James Moyle, who began work in Melbourne in 1848 and was among the first organbuilders in Victoria. The Moyle organ has social significance for its continuing role in aiding religious worship in the state since the early days of European settlement. 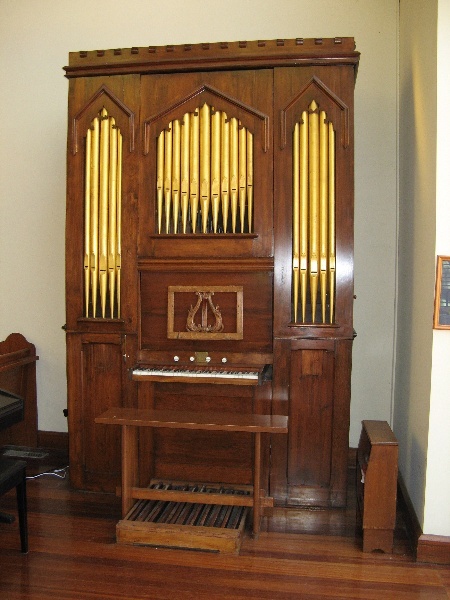 The object described as the Moyle Organ, currently located in St Linus' Anglican Church, 19 Glyndon Avenue, Merlynston. Organbuilding was one of the earliest craft industries in colonial Victoria, despite the fact that it required careful training and highly technical skills. As early as 1842 there were men in Melbourne who, although not organbuilders by trade, erected organs imported from England and did tuning. Early organbuilders in Melbourne included James Moyle, Jesse Biggs, Henry Smith, Robert Mackie, William Anderson and George Fincham. All but the last relied on imports for some of the parts, particularly metal pipes. The nave of St Linus' Church was designed by the architect Charles Heath (1867-1948) and built in 1932. It was planned as the first section of a more imposing building which, when complete, would have included transepts, a central tower and spire and a sanctuary. These later sections were never completed. In 1978 Vanne Trompf redesigned the building, reversing the original orientation so that the congregation now faces west towards an ambulatory. The crossing arch was filled with a striking steel and glass structure which houses the baptistery. The building is notable for its absence of ornamentation and lofty, well-proportioned interior. It is the only known example of Heath's church architecture, although he carried out considerable work at Fawkner Crematorium nearby. Charles Heath spent his career in Western Australia and Victoria, becoming an Associate of the Royal Victorian Institute of Architects in 1890. He was both architect and surveyor. When he applied successfully for registration with the Victorian Architects Registration Board he stated that for the previous 17 years he had practised that profession in Melbourne. Heath submitted a design for the 1912 competition to design Canberra (Entry no 60 of 137) and was in the final 46 shortlisted. For the City of Coburg he designed new offices, a town hall and a soldiers' memorial hall with clubrooms, which opened in 1922. He also designed the Fawkner Crematorium (1926) Melbourne's first crematorium complex, in the Greek Revival style, richly decorated and sumptuously furnished, which operated until the late 1970s. The organ now in St Linus' was built, probably in the 1850s, by James Moyle, of Ivy Cottage, High Street, Prahran. It is the only known example of Moyle's work to survive and is the earliest known example of the craft of organbuilding in Victoria. Little is known of the history of the organ. It is likely to have been built for a private home and it could have been the Moyle organ at one stage in St John's Anglican Church, Horsham. Unfortunately no documentary evidence has yet been uncovered. At some stage the pedal pulldowns were added and the hand blowing arrangements modified. 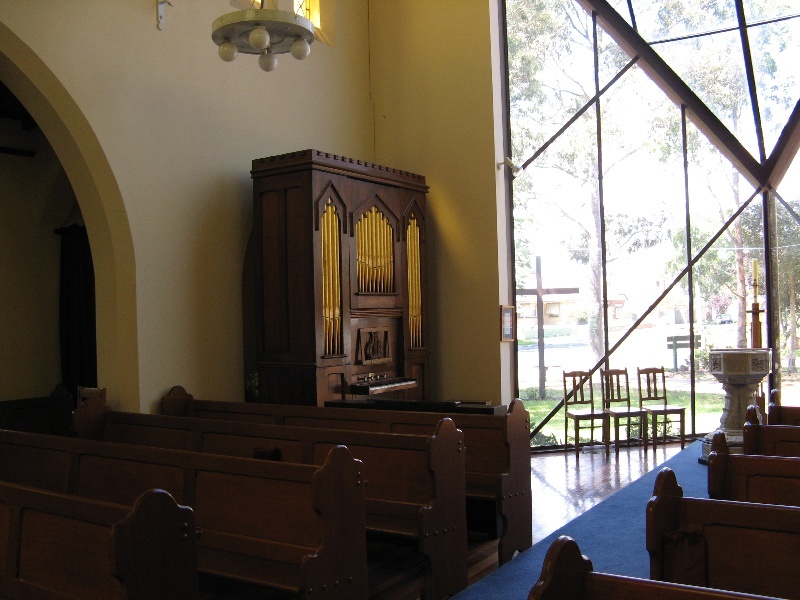 In about 1975 the organ was removed from St Cuthbert's and stored in the parish hall of Christ Church, Glenlyon Road, Brunswick. In 1978 it was given to the National Trust of Australia (Victoria) by the Christ Church parish, and it was decided to place the instrument, following restoration, at St Linus' Church on permanent loan. The restoration of the instrument, funded by a National Trust appeal coordinated by the Organ Historical Trust of Australia, began in early 1984 following the launch in 1983 of the appeal by the Prime Minister of Australia and patron of the appeal, Bob Hawke. The restoration work was carried out by George Fincham & Sons of Richmond, who were responsible for restoring the windchest (including the fitting of a new table), bellows, action and pipework. The casework has been restored by George Vlahiogannis, of Rendec Pty Ltd of Northcote, who is well known for his skilled restoration work at a number of National Trust properties. In 1985 the organ was rehoused in St Linus Anglican Church, Merlynston, and was officially unveiled on 23 April 1989. 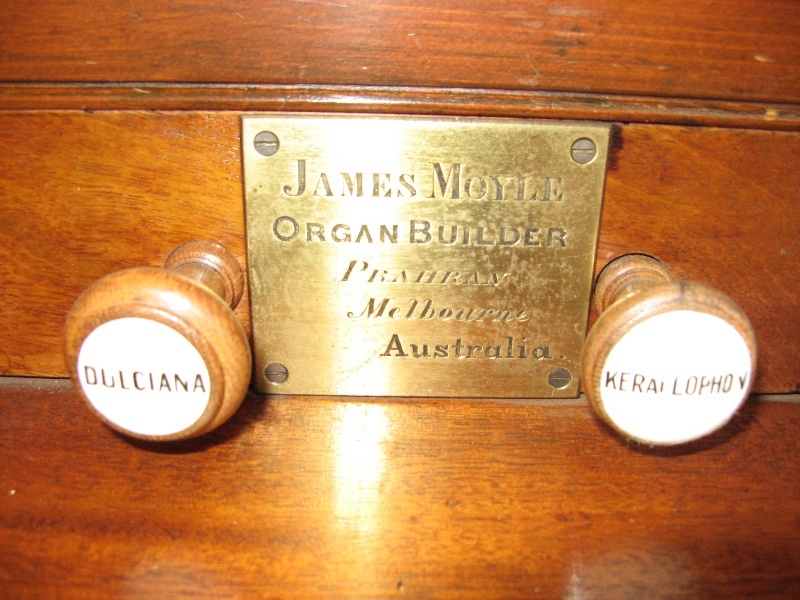 The Moyle organ is the oldest known example of local organbuilding in Victoria. It is the only known surviving example of the work of James Moyle, who began work in Melbourne in 1848 and was among the first organbuilders in Victoria. 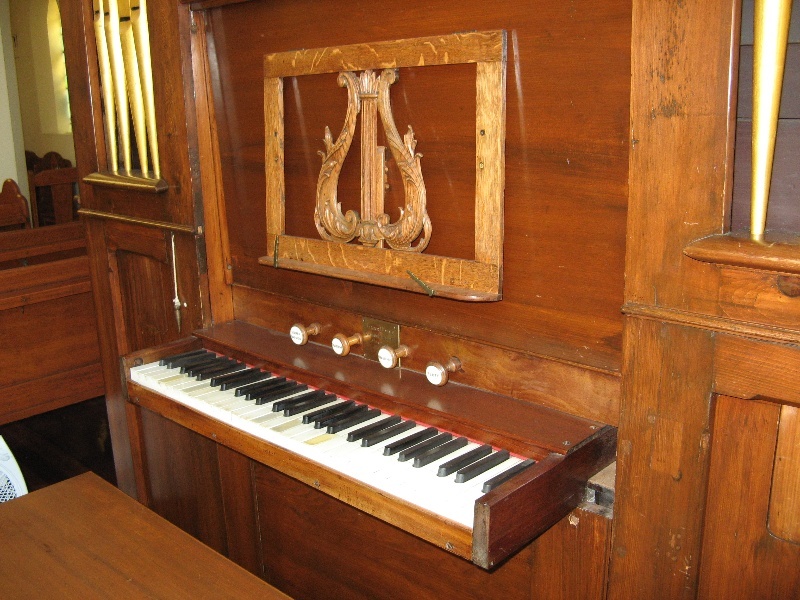 The Moyle organ demonstrates a level of organbuilding technology in Victoria in the 1850s which was unmatched in local organbuilding for another decade. The Moyle organ has been used for religious worship in Victoria for a century and a half, since the early years of settlement in the colony. This is Victoria's oldest locally made organ, built in the 1850s by James Moyle, an Englishman who began work in Prahran in 1848. It was restored and placed in this church in 1985. 2. Should it become apparent during further inspection or the carrying out of works that original or previously hidden or inaccessible details of the place or object are revealed which relate to the significance of the place or object, then the exemption covering such works shall cease and Heritage Victoria shall be notified as soon as possible. 3. If there is a conservation policy and plan endorsed by the Executive Director, all works shall be in accordance with it. Note: The existence of a Conservation Management Plan or a Heritage Action Plan endorsed by the Executive Director, Heritage Victoria provides guidance for the management of the heritage values associated with the site. It may not be necessary to obtain a heritage permit for certain works specified in the management plan. Routine maintenance: Pipe Organs require regular servicing particularly tuning and attendance to action problems. Such procedures usually take place monthly, quarterly, half yearly or annually. Such activities would not impact in any way on the heritage status of the instrument provided they are carried out by appropriate firms, and would not require a permit. All conservation, maintenance and repair works should be carried out in accordance with the standards outlined in the document produced by the NSW Heritage Office in consultation with the Organ Historical Trust of Australia, Pipe Organ Conservation and Maintenance Guide, specifically points numbered 1, 2 and 3. All other works require a permit. The preparation of a Conservation Management Plan is encouraged. 1. Cleaning and overhaul: This should ideally take place around every ten to fifteen years depending on the location of the organ. If pipework is removed from an organ for cleaning, it should never receive any revoicing or alteration. 2. Restoration: This work should always be carried out in association with an approved independent professional consultant who would develop a schedule for the work and nominate accredited organbuilders from whom quotations can be sought. The consultant can assist with the obtaining of relevant permits from Heritage Victoria, liaise with the custodian of the instrument (and Heritage Victoria) as the work proceeds, and sign off the work when it is completed according to the original schedule, write a report and authorize final payments. All work should conform with the Conservation and Maintenance Guide noted above. 3. Other work may be necessary from time to time, such as renewal of electric blowing plants, re-leathering of reservoirs, etc. Permits should be sought for such work to ensure that they comply with heritage standards. 4. Activities involving alteration to instruments (such as changes to action, pipework and case decoration) would, in most instances, fall outside what is permissible.